Psychology is certainly a complex science. Where physical cuts and bruises can be healed, mental conditions are not so easily treated. How can you tell that a patient has been cured? Who is qualified to make such a judgement? Then there's the flip side. Can you really trust a psychiatrist? How do we know the pills we're taking are truly helping, and not inducing some horrific side effect? 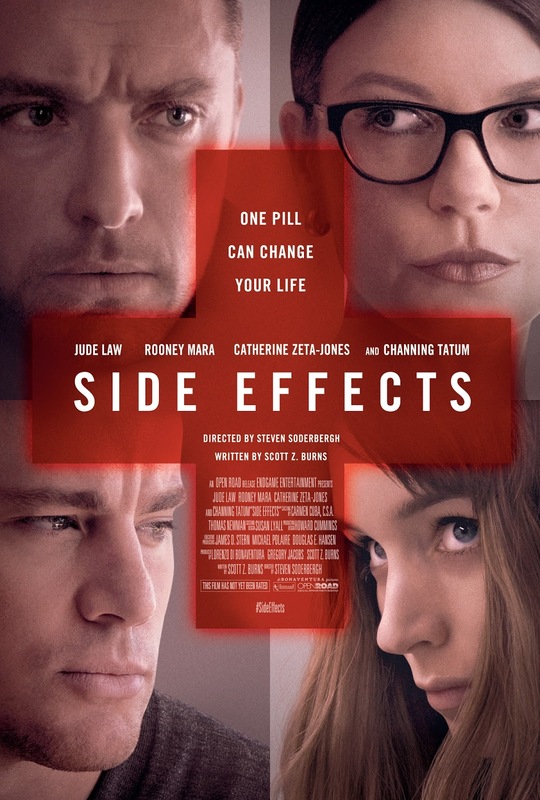 Through washed out visuals and limited use of music, Soderbergh presents us with a cold, bleak outlook on American psychiatric care, in a world where pills are always the answer. There's a hierarchy in place, whereby patients are controlled by their psychiatrists, who in turn are controlled by competing pharmaceutical companies. When everyone is so easily manipulated, who can be trusted? The narrative shows us both sides of the coin: Emily (played by a suitably psychotic Rooney Mara) who suffers from depression, and her psychiatrist Dr. Banks (Jude Law). Under the influence of drugs prescribed by Banks, Emily murders her husband. But who is to blame? Did the patient intend to kill, or was the psychiatrist's prescription ill-judged? The concept behind Side Effects is a sound one that explores intriguing themes, but as a thriller it is dissatisfying. What follows after the murder, is a long-winded detective plot whereby both parties attempt to prove their innocence. The denouement, when it finally arrives, feels unbelievable and overly confused, bound up in layers of psychology and flimsy motives. Though many have likened Side Effects to a Hitchcockian thriller it's lacking one vital ingredient: suspense. Mara's performance might be gripping but the plot, sadly, is not.